Why Investing for the Long Term Works - And it's not Rocket Science! You might recall from school science lessons having to memorise formulas that would become critical tools for your survival in the world. Formulas like Speed = Distance/Time. This is the science that we are most familiar with. However, it has a problem. It is no use whatsoever for measuring and observing the very small. Electrons, for example, just don’t play to same rules as the big stuff. They pop in and out of space, seemingly travelling distance in no time at all. Some sub atomic particles have an instantaneous link between them that remains strong, secure, and undiluted no matter how far apart they may be, even if they're on opposite sides of the universe. If you change the spin of one of the particles the other's spin will change too, instantaneously! Einstein spent a lifetime trying to solve this problem and we are still a long way from a unifying scientific theory that can explain the big and the very small. Unfortunately, we at Castle Point cannot help. However, we have uncovered an investment problem of similar magnitude presented to us by none other than Mr Warren Buffet. On the top of Warren Buffet's recommended investment book reading list are two books. The first is Benjamin Graham's "Intelligent Investor". The second book is "Common Stocks, Uncommon Profits” written by Philip Fisher. Benjamin Graham's approach to investment is based on ensuring that you do not pay too much for a company. Determining how much to pay is based on what the company has done, what it has been able to earn and what assets it has. When a company's share price ventures too far above these tangible measures it must be sold. Philip Fisher's approach is totally different. Fisher uses far less tangible measures for finding investment opportunities. Management integrity is high up on the list. The price that you pay for a company is given less importance. And once found great companies should be retained, hopefully forever. The sciences behind these two investment approaches at first glance seem to be as incompatible with each other as the sciences of the big and the very small. One rule says valuation is everything, the other places much less emphasis on it. One approach looks to the past and present, the other looks to the future. One uses tangible anchors for valuation like earnings and assets. The other uses less tangible, more qualitative measures. One approach might result in you buying a company, other might result in you selling it! How is it then that you can invest successfully and do both? We believe that we have the answer to this. A theory that unites and reconciles the investment sciences of growth and value. We call it the "General Unifying Theory of Investment Relativity". Take three companies. If you assume an investment horizon of roughly one year (which appears to be roughly the current investment horizon of the market given market turnover statistics) the charts of these companies might look like this. The market inside one year is noisy place. Inside a day, share prices can easily move up or down a few percent, often as a result of news that the market deems might have an effect on the company. If you want to be certain to make money inside one year on the share market, it is likely that you will be focused on beating the market when it comes to important pieces of news flow like earnings. This is a very difficult game to play and win regularly as there are many smart people trying to do exactly the same thing. Behavioural finance research also shows us that we are biased to thinking that we are good at this when we are not. We tend to remember our successes and quickly forget our failures. In our opinion, this approach is likely to produce mediocre performance in the long run for most people who try. Yet, it appears that this is approach of most of the market given the high turnover of stocks that occurs. Now take the same three stocks and look further out, say three years. This is what we look for. The yellow line is the stock price of an average company. It trades close to its intrinsic value, which doesn't change much. Price volatility is caused by changes in investor sentiment driven by changing news flow about the company. The black line shows the path of what we call a quality company. Its intrinsic value steadily moves upwards due to the compounding effect of small but steady positive incremental advances made by good management decisions made inside a well-placed business. 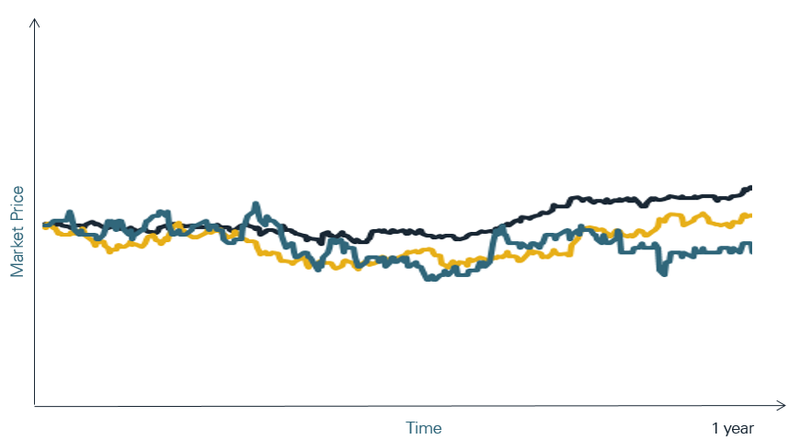 The blue line shows the potential path of what we call a value stock. These companies are going through hard times, sometimes due to poor management, other times due to cyclical downturns in their industries. Fear of further declines in the prospects of these companies for the following year stops investors with a short investment horizon investing. We try to look past the short term noise of equity markets and look for these opportunities. An investor with only a one-year investment horizon simply cannot use this approach. With value stocks, the best time to buy is when news flow is terrible. You can never be sure that the price has bottomed and there is always a chance that your returns over a short horizon will be poor. With quality stocks, the small, incremental gain the company makes in one year, that makes such a difference when compounded over the long run, will be swamped by noise created by short term news flow. Investors with a short horizon might rationally sell a great company with great long term prospects if they think its next profit announcement might disappoint. The particularly interesting point about this is that the behaviour of the investor with a short term horizon is that it is rational. If you turn your stock portfolio over ever year you have to have a short term investment strategy. The long-term intrinsic value of a company is simply less important. We see real examples of this. Broker research, which is often short term in its perspective can have a buy or sell recommendation that is different from the than the analysts' view on a company's long term intrinsic value. 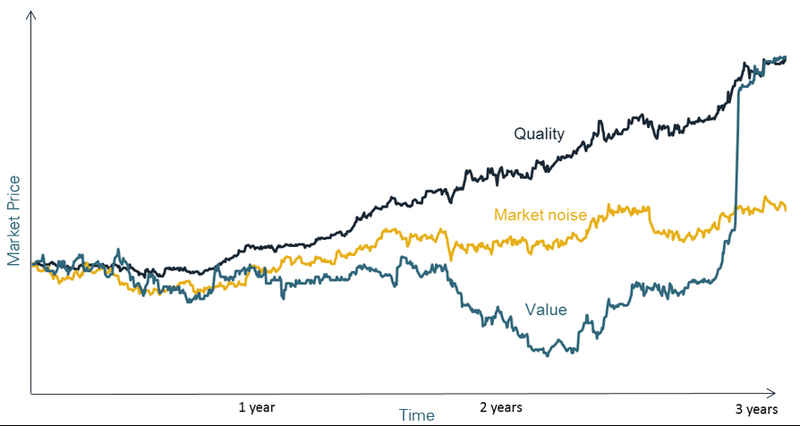 This is often the case with value stocks where the price target is derived after adding significant discounts to a Discounted Cash Flow model or other valuation method for "uncertainty". Stating that an investment approach is relative to its investment horizon is not exactly rocket science. Retirement portfolios are often tailored to your life stage. The closer you are to retirement, the less risk you generally take. It is our opinion, though, that this rule can also be extended to stock picking. We believe that you can beat the market in the long run by taking a long run view on the prospects for a company. Even if market investors agree with the longer term outlook for a company they might not take advantage of that knowledge if they have a short term investment horizon. You don't need to be smarter than the market, you are just playing a different game. If you run a marathon you might well beat Usain Bolt if he is trying to break a world record every 100 meters. The key is to have the discipline to stomach the storms that short term volatility in markets can give you. This is easier said than done. In a world of instantaneous stock price alerts, quarterly earnings announcements and monthly performance reviews it is difficult not to get caught up in the short term noise. To take advantage of this approach you must accept that you have no control over short term performance. Simple, but not easy.